In both a craniotomy and a craniectomy, a bone flap (a good sized piece of the skull) is removed in order to allow the neurosurgeon to access the brain. 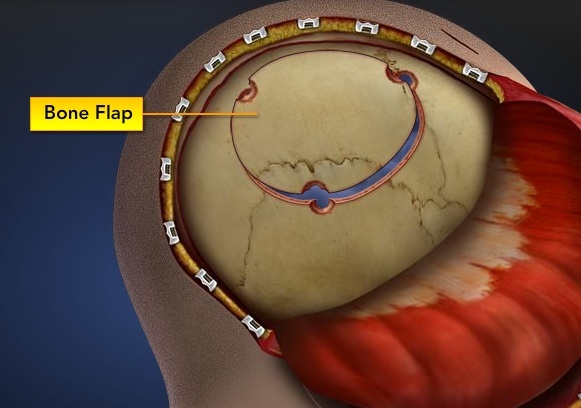 The difference between the two procedures is that in a craniotomy the bone flap is returned at the end of the surgery and in a craniectomy, the bone flap is left off, in order to allow the brain more room for expansion. Often times in a craniectomy, the bone flap is stored in a freezer until the brain has sufficiently recovered and then a second surgery is performed to return the bone flap to the skull. If the bone flap cannot be replaced, artificial bone or plates may be used to do the reconstruction of the skull. Often times, there will be a less than perfect fusion of the skull after the surgery, resulting in defects in the skull. The amount of skull that needs to be removed depends to a large extent on the type of surgery being performed. The bone flap is then replaced using titanium plates and screws or another form of fixation (wire, suture, …etc.). There may be complications which may include seizures. Because of this it is common to give the patient anti-seizure medicine for seven days. Bacterial meningitis is also a known complication. Pain may be a factor in post-craniotomy patients which can be managed through the use of scalp infiltrations, nerve scalp blocks, and morphine. As shown, in a Craniotomy, the neurosurgeon removes a piece of the skull, the bone flap, in order to relieve ICP. The next subject we will cover is Severe Diffuse Axonal Injury. Follow the link below.